In order to support positive transition outcomes for youth in New Hampshire, it is imperative that preservice special education programs address critical transition knowledge and skills including evidence-based practices (Morgan, Callow-Heusser, Horrocks, Hoffmann, & Kupferman, 2014; Morningstar & Frey, 2013; Morningstar, Hirano, Roberts-Dahm, Teo, & Kleinhammer-Tramill, 2017). According to Morningstar, et al. (2017), educator preparation programs continue to struggle with providing evidenced-based transition content in their programs. To that end, the NH Department of Education, Bureau of Special Education Next Steps New Hampshire (NSNH) grant initiative facilitated a set of field-developed core competencies to enhance special education teacher candidate transition knowledge and skills. This was part of a comprehensive professional development effort to link preservice and inservice efforts for special education teachers in NH. 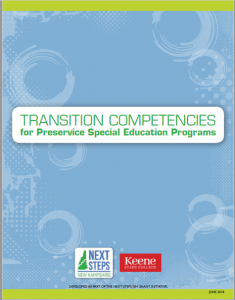 The first version of the Next Steps NH Transition Competencies for Preservice Special Education Programs was developed in 2014 and piloted in preservice special education certification programs at Keene State College and Plymouth State University. The competencies and elements were revised in 2018. The framework includes a set of six transition competencies and 31 corresponding elements. The six competencies are central to the overall framework and the elements identify areas of knowledge or skill determined to be important by NH transition experts from the field, including college and university faculty. This framework allows for maximum program flexibility in curriculum development. The goal is for the competencies to enhance curriculum efforts to increase transition knowledge and skill development of special education teacher candidates. The competencies are not required for NH General Special Education certification, K-12. In 2013, the Next Steps NH Leadership Team formed a subgroup comprised of field-based transition specialists and higher education faculty to begin the process of developing the competencies and corresponding elements. The competencies and elements were developed in the context of established transition program improvement areas from the original Taxonomy for Transition Programming (Kohler, 1996; Kohler & Field, 2003) and updated to reflect the revised Taxonomy for Transition Programming 2.0 (Kohler, Gothberg, Fowler, & Coyle, 2016). The NSNH project also utilized the Taxonomy as a basis for in-service professional development in NH high schools. The Council for Exceptional Children Advanced Special Education Transition Specialist standards (2013) were used as the primary guide for the initial development of the competencies. Several of these statements were adapted for preservice special education. The Council for Exceptional Education Initial Level Special Education Standards (2012) were also reviewed to determine how the competencies connected to these standards. Additionally, Test, Toms, and Scroggins (2011) identified key transition competencies for secondary special educators in Tool for What Secondary Special Education Teachers Need to Know. These national competencies were cross-referenced with the NH Transition Competencies for Preservice Special Education Programs. The NSNH Leadership Team provided a final review for feedback and revision. Relevant literature, reviewed to inform initial competency development, included Benitez, Morningstar, and Frey, 2009; Kohler, 1996; Kohler and Field, 2003; Morningstar and Frey, 2013; Test et al., 2009). From 2015-2018 these competencies were piloted in special education programs at Keene State College and Plymouth State University and used to identify gaps and needs in transition curricula and special education courses. Additionally, preservice candidates were asked to evaluate their knowledge and skill levels at different points in their programs. Over the course of the pilot, faculty from both institutions provided ongoing feedback and suggestions for ways to improve the use and applicability of the competencies and elements. In Spring 2018, feedback from the pilot study was used to revise the field-developed competencies. Several new pieces from the transition literature were reviewed to inform the revisions and updates (Morgan, et al., 2014; Morningstar & Mazzotti, 2014; and Morningstar, et al., 2017; National Technical Assistance Center on Transition, 2016; Kohler, Gothberg, Fowler, & Coyle, 2016). A survey was also developed to obtain feedback from transition experts, both from NH and nationally. A total of 16 transition experts (i.e., higher education faculty, state department of education administrators, special education directors, transition teacher/specialists, and parents) provided feedback and rated each of the competencies and corresponding elements for how important they were for inclusion as preservice special education competencies. Qualitative feedback about improvement to the competencies was also elicited from survey participants. This feedback was reviewed by NSNH project staff who, in turn, used this information to make final revisions. Assessment competencies support the development of practices that use assessment information and facilitate students’ self-determination to develop individual education programs based on students’ post-school goals. 1. Use information from a variety of transition assessments to inform student-centered transition and career development planning. 1.1 Describe a variety of formal and informal age-appropriate transition assessments used to identify students strengths, preferences, interests, and needs critical to transition planning. 1.2 Conduct transition assessments, understanding strengths and limitations of each, and adapt to individual student needs. 1.3 Engage students in the transition assessment process so that data gathering is done in collaboration with the student. 1.4 Communicate the results of transition assessment information so they are understood by students, families, and professionals. 2. Develop student-centered IEPs that are transition-focused and include student voice. 2.1 Demonstrate knowledge of how to incorporate state and federal transition requirements into an IEP. 2.2 Write measurable postsecondary goals that reflect student voice and are based on age-appropriate transition assessments. 2.3 Design transition services (i.e., coordinated set of activities and course of study) to reasonably enable a student to meet his or her measurable postsecondary goals. 2.4 Write measurable annual goals and objectives related to a student’s transition needs. 2.5 Demonstrate knowledge and use of strategies to empower students to have a voice in their IEP meetings. Student development competencies support the development of practices that emphasize life, employment, and occupational skill development through school-based and work-based learning experiences. Student assessment and accommodations provide a fundamental basis for student development resulting in successful transitions. 3. Design student-centered curriculum, instruction, activities, and accommodations to facilitate students’ preparation for and movement toward their postsecondary goals. 3.1 Demonstrate knowledge and use of self-determination and self-advocacy strategies and curricula. 3.2 Explain how to prepare students to participate in a range of post-school options including postsecondary education and training, employment, independent living, and community engagement. 3.3 Demonstrate knowledge and use of evidence-based transition instruction, curricular resources, and practices. 3.4 Demonstrate knowledge and use of work-based learning experiences including Extended Learning Opportunities (ELOs). In New Hampshire, ELOs are rigorous credit-bearing learning experiences that take place outside a classroom. 3.5 Demonstrate knowledge and use of assistive technologies to support a student’s transition to postsecondary education and training, employment, independent living, and community engagement. 3.6 Demonstrate knowledge and use of curricular resources and instructional activities that support transition planning in general education settings. Collaboration competencies facilitate the involvement of school personnel, community businesses, organizations, and agencies in all aspects of transition-focused education. 4. Collaborate with stakeholders on effective transition services, activities, and supports in order to produce successful post-school outcomes for students with disabilities and their families. 4.1 Describe the range of transition resources available in the school and the community. 4.2 Describe the roles and responsibilities of educators, employers, and other service providers in a variety of settings related to transition planning and programming. 4.3 Demonstrate knowledge of strategies used to prepare meeting participants and facilitate transition planning before, during, and after IEP meetings. 4.4 Demonstrate knowledge of strategies that facilitate collaboration among transition stakeholders. 4.5 Describe the processes for students to engage with postsecondary education and community services. 4.6 Describe ways to collaborate with general education teachers to integrate transition concepts into academic courses and activities. 4.7 Demonstrate professional ethics in collaborating with students, families, school personnel, community, and agency personnel. Family engagement competencies support parent and family participation in planning and delivering education and transition services. Family-focused training and family empowerment activities increase the ability of family members to work effectively with educators and other service providers. 5. Actively involve families throughout the transition decision-making and implementation process, with sensitivity and responsiveness to culture, language, and socioeconomic background. 5.1 Explain the significance of family engagement throughout the transition planning process and how it connects to increased student success. 5.2 Identify family cultural and environmental factors that might impact transition planning. 5.3 Provide supports necessary for families to communicate effectively and work collaboratively with school and agency personnel. 5.4 Identify resources to help families understand transition-related education services, IDEA, and potential support networks and services. Program structure competencies support efficient and effective delivery of transition-focused education and services, including philosophy, planning, policy, evaluation, and human resource development. The structures and attributes of a school provide the framework for a transition perspective. 6. Demonstrate knowledge of transition laws, policies, evidence-based practices, and program structures. 6.1 Identify evidenced-based transition practices, programs, and services that produce successful post-school outcomes. 6.2 Summarize major elements of transition-related laws and policies (e.g., IDEA, Section 504 of the Rehabilitation Act of 1973, Americans with Disabilities Act, and Workforce Innovation and Opportunity Act). 6.3 Explain the importance and identify elements of a student-centered Summary of Performance (SOP). 6.4 Describe a range of secondary program options that support a student’s transition interests and needs (e.g., Career and Technical Education (CTE), online courses, dual high school/college credits, Upward Bound, etc.). 6.5 Identify organizations, resources, and publications relevant to transition planning and programming.